Well, there's nothing like waiting until the 22nd day of a 30 day challenge to release the introductory blog post, is there? I'm over two thirds of the way through my SiProDeMo and it's been a busy three weeks. And if you're saying, "Who the hell is Casey Neistat?" then watch this video and get suitably pumped up (as well as the Carte Postale song stuck in your head)! There has been one idea that I've kept coming back to, and that's my Marmite Jar Decision Maker. It's been brewing for years, and I've researched and prototyped parts of it but have never made it to completion. The idea came from when I saw how many electronics kits were designed to fit in Altoid tins. I say, 'designed', but really they are meant to fit in a small enclosure and an Altoid tin is a cheap and practical option. The tins struck me as quintessentially American, especially as they were really difficult to get hold of in the UK. That's changed now, but having to hunt down one of these tins, sometimes at reasonable expense, for a hobby electronics project, seemed to miss the point. I decided that it would be great if there was some electronics kits designed to fit in something quintessentially British. What could be more suitable than a Marmite jar? An Altoid tin has a lot of great qualities for electronics projects - it's easy to cut holes in, it's designed to fit in a pocket and when you take the lid off, you have access to the whole of the inside. A Marmite jar has none of these qualities, but there's some other aspects that are useful for electronics. The glass is capacitive, is great for shining lights through and you can cut holes in the lid. As it won't rust, I've been wondering about how I might be able to use some electronics geekery to stop me killing any more plants in the garden. That's not to mention that it simply looks damn cool. The Marmite jar, in my opinion, is a design classic and unlike a lot of electronics kit enclosures, it would look great displayed on a shelf or desk. The idea for the decision maker comes from the long running Marmite advertising campaign, playing on the divisive nature of it and splitting the public in to 'lovers' or 'haters'. I'm terrible at making decisions and, being a geek, I also have a tendency to over engineer solutions when it's for fun. I wanted to learn more about electronics so I decided to make a kit that would fit in a Marmite a jar and do the electronic equivalent of a coin flip - flashing LEDs between two options on the front. The electronics for the project are heavily based on the SpikenzieLabs dice kit. 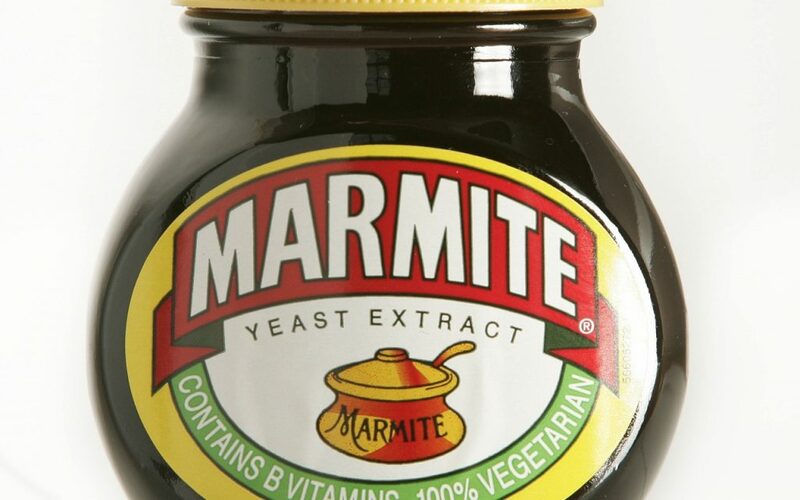 It's simplified by there only being two options, but complicated by housing it in a Marmite jar and having it activate by a tap on the lid, rather than knocking the whole thing against a table. Also Fearless Night has posted a number of suggested modifications to the firmware on the PIC microcontroller, as well as the hardware to improve the brightness of the LEDs, tap sensitivity, number randomness, etc. All of this forms an extremely useful starting point for the project and makes me feel more confident given my amateur electronics skills.